Since the European colonization of New York City, the habitat of the five boroughs has been transformed into a rather unique ecological niche. Urbanization has created local challenges to our wildlife, and some of our species have managed to adapt to these artificial changes. One species, the harbor seal (Phoca vitulina), was once seen easily along the foreshores of the northeast, which included New York City. However, populations disappeared for nearly a century before returning to the area a couple of decades ago. The shift in demographics prompts a singularly important question: Why are they back? Three years ago, we decided to tackle this complex question. Our goals are to: 1) better understand why seals are coming back to New York City, 2) identify the ecological conditions that enable the success of returning populations, 3) discover how they are able to cope with man-made changes, and 4) consider the impacts of the urban environment on behavioral interactions, such as communication. Along with our undergraduate research students, we have watched harbor seals along the waterfront in New York City over the last three field seasons using non-invasive naturalistic observations. As harbor seals are typically found here from mid-October to early-April, we focused our efforts on select land-based locations in Brooklyn and the Bronx, while fielding reports of sightings in Jamaica Bay, and the Rockaways in Queens. Initially, we aim to capture demographic and atmospheric data to monitor relative populations at each location. Once we have a fairly decent picture of the local seal population, we will then start more comprehensive behavioral observations, such as responses to environmental noise–both visual and auditory. Indeed, a bigger part of our research is to consider a conservation and education perspective. Marine mammal populations all over the world were affected historically by commercial hunting. 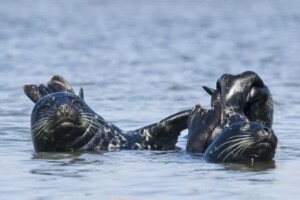 Even under the protections of the Marine Mammal Protection Act of 1972, which has restricted capture, species face many other challenges to their survival, such as toxicity, pollution, disruption to their navigation, and climate change. It is likely that independent factors may selectively impact the success of each species, but a combination can be lethal. Moreover, as we understand how harbor seals, a model species in an urban environment, can cope or adapt to these changes, it may help us understand how other marine and aquatic species may do so as well—and how we may aid them by reducing man-made challenges. In order for such measures to be implemented, it is important that the public value the importance of marine mammals in their own backyards, and demand changes that would be beneficial to them. In this vein, we started collecting survey data that asked how many people knew about the presence of indigenous fauna, and more specifically marine mammals, in New York City. Not surprisingly, a relatively small number of people were familiar with the presence of local fauna. This suggests that education is important, and we hope that this may prompt further involvement from the public. We’re lucky to have teamed up with other researchers, university institutions, and non-profit organizations, particularly with NYC Audubon. Starting last year, NYC Audubon allowed us to tag along on their Sunday seal watching trips to Swinburne and Hoffman Islands to collect data on the seals found in the lower Hudson River. This has been a tremendous help to our data collection, and provides us with both comparable land-based and boat-based observations. We have already started our field-based observations this year, and will begin our boat-based trips with NYC Audubon on January 12. We have already seen healthy numbers, and hope to complement them with our trips to Swinburne and Hoffman. For those who wish to know more about our research, please feel free to contact one of us, and certainly we hope to see some of you out there with us. To see New York City’s harbor seals for yourself, click here to register for one of our upcoming Winter Seals and Waterbirds tours, running from Sunday, January 12 through Sunday, March 9.